Most people have experienced how important budgeting is when money is short. Back when one unplanned night out could leave you eating rice noodles for a week, budgeting was a necessity. As finances become less about dinner and more about vacation, however, many Americans let budgeting fall by the wayside. As tempting as it may be to just enjoy the ride, there are still good reasons to budget. Think back to before you made plenty of money. Not to when you were young and making minimum wage, but your first or second professional job. Did you increase your quality of life to reflect the increase in your salary? If your answer is yes, you’re not alone. It is called lifestyle inflation and it happens to nearly everyone. Our spending habits naturally balloon to meet available funds. Some of this inflation is reasonable. Paying higher rent to live alone instead of with roommates, for example. Some is not. A comfortable life on one salary quickly becomes a more comfortable life on a larger salary. If you are like most people, you need a budget to help you avoid spending every cent. Budgeting and financial goals help people live with a different mentality. Small amounts of money spent on frivolous things that don’t actually increase quality of life. Budgeting helps you redirect money toward things that do increase quality of life. This could be bundled into meeting financial goals, but it is best to treat retirement separately. Retirement is the most expensive long-term savings goal most people will ever undertake. If you haven’t done the numbers already, you will be shocked by the savings needed to retire comfortably. Check out this online calculator to give you an ideas of your own retirement needs. Retirement savings is a bigger problem for the well-off, ironically enough. Having grown accustomed to a certain salary and lifestyle, people with larger incomes need to save even more in order to maintain that standard of living in retirement. Even people who are on track for retirement and have a system for saving benefit from a more robust budget. One reason is to keep track of spending habits. Your budget reveals more than just your finances. Have your shopping habits become more than a hobby? Are your bar tabs worrying? You may be able to afford the $250 a month you spend at Starbucks, but do you really want three lattes worth of caffeine roaring through your system each day? Keep a budget to keep track of your habits. The first step toward changing a worrisome, tiresome or unhealthy habit is to know it exists. If detected early, unauthorized credit card charges are usually no big deal. Most banks will reimburse funds and you can cancel the compromised card. If not detected, things aren’t as simple. It is common for scammers to make a series of small charges. One unauthorized charge of $12.72 may not be a big deal, but several hundred innocuous charges over the year will make a real dent in your finances. People who don’t keep close tabs on their money are also more susceptible to allowing so-called continuity scams to go unchecked. These scams charge you a monthly fee for a service you don’t want or use but were tricked into purchasing, often through a cellular phone bill or other monthly, variable expense. Budgeting is a habit that needs to be built and maintained. It is a significantly more enjoyable chore to budget when you have money. Watching the black line rise and the red line disappear on a spreadsheet is always a pleasant experience. But just the action of budgeting ensures you’ve adopted a healthy habit for life, one that can feed into your other good habits and reinforce them. Next article5 Ways to Make Your Coffee Taste Great! Hey Buddy!, I found this information for you: "Make Plenty of Money? 5 Reasons You Still Need a Budget". 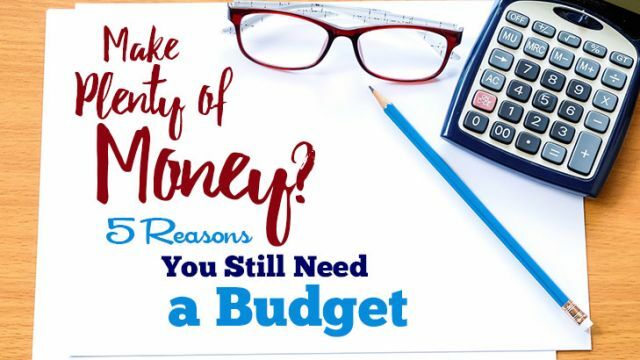 Here is the website link: https://www.thealternativedaily.com/make-plenty-money-5-reasons-still-need-budget/. Thank you.